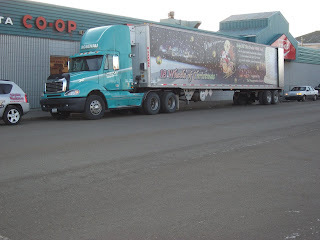 2009 is the first year for Rosenau Saskatoon to come on board with the 18 Wheels of Christmas food drive, and they couldn't be doing better. Thanks to 18 Wheels Saskatoon coordinators Tim Rosenau and Carrie Willey, big things are brewing in Bridge City and the 18 Wheels trailer will make several stops to Saskatoon this holiday season! The trailer was involved with the 19th annual Saskatoon Santa Clause Parade and it was a huge success! Rosenau Saskatoon and the 18 Wheels program received honorable mention from the Festival of Trees in Saskatoon. The are several more chances to donate to your local Saskatoon Food Bank with the 18 Wheels of Christmas program before our police escorted delivery to the food bank on December 14. Join us at the Mall at Lawson Heights from 9am - 3pm on December 12 or The Centre Mall from 11am-3pm on December 13 and help fill the trailer. As with previous years, the 18 Wheels trailer is traveling through East Central Alberta with the Lloydminster Christmas Convoy! On December 3, the convoy stopped at the East-Alta Co-Op in Vermilion, AB. With Lloydminster local radio station, The Goat, on site, donations poured in. Then it was on to East-Alta Co-op in Wainwright on December 4. The convoy will be back in Lloydminster on Saturday, December 5. We will be set up on site at the Co-op Marketplace and Safeway grocery store in Lloyminster. Stay tuned for updates and progress in the Lloydminster 18 Wheels drive! 18 Wheels is trucking on in Calgary ! 18 Wheels Calgary launched Oct 2nd emailing and handing out our new flyers designed by Tori of Pro Trucker magazine. We had our firstmedia interview on Oct 8th with Reed Black of LandLine Now out of Grain Valley Missouri a Sirius Radio Station. Reed has done a start and a finish with us for the last 2 years and it is always exciting talking with him. 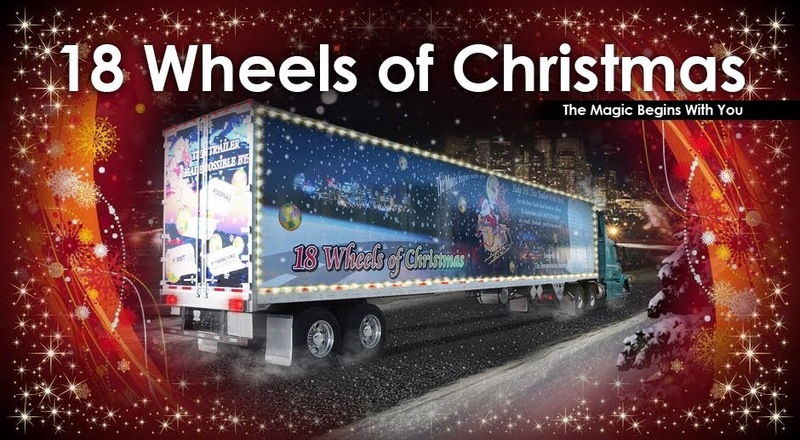 Pro Trucker Magazine, Truck News and Today’s Trucking each did a story on the 2009 18 Wheels of Christmas campaign to help kick start the drive. November 14th Douglas Square Sobey’s. 11:30 AM to 1:30 PM. Santa, the 53’ Christmas trailer and helpers spent the 2 hours handing out Christmas canes and accepting donations. Our first ever evening engagement and we really enjoyed it. We had the original 48’ Christmas trailer all lit up ready to accept donations. November 28th Lake Bonavista Promenade 9:30 AM to 1:00PM 6th year at this location and as always Santa and helpers enjoyed meeting the residents and accepting donations. As always, you can call Rosenau Transport and we will pickup your donations. New this year, you may always drop your food donations off to one of our collection bins set up around the city. See below for your closest collection bin.